One problem that some of us have with testing blood sugars comes from a fear of diabetes itself and this can present a significant barrier towards controlling diabetes properly. Fear of diabetes can mean that getting bad blood glucose results really does feel painful and this often acts in two ways. In some people it acts as a motivator to face and beat the fear and get blood glucose levels under control. In others though, it can have an opposite effect and put some of us off testing our blood sugar or analysing the results. If bad results put you off controlling your diabetes, it’s time for a re-think. One of the reasons why bad results can put us off controlling diabetes comes down to our own confidence. The truth is, confidence can be both built and re-built. The main thing you’ve got to do is not give up at this point. Instead, look to build up your armoury. 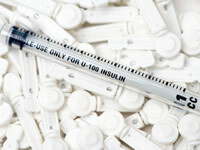 In diabetes, knowledge is a vital tool. If you’ve been testing sugar levels but struggling with getting the right results, it’s time to get some more information to work with. Before we look at what can be done, let’s look at some key facts. Diabetes is not impossible to control and yes, you can control your diabetes. Another positive point to bear in mind is that complications can be avoided and a long life can be lived with diabetes. People diagnosed in the earliest days of insulin have lived over 85 years with the condition and, with improvements in diabetes care that we’ve seen over the last near one hundred years, even more is now possible. So, let’s take a look at what you can do to both build confidence and take more control. The people who have really good control generally share one thing in common and that’s they test blood sugar levels more often than people with less good control. This is certainly the case in type 1 diabetes and people dependent on insulin. If you’re not a big fan of testing your blood sugar, take it from us, testing becomes a whole lot less of a pain when you start seeing better sugar levels. Prepare yourself for bad sugar levels, but don’t let it bother you. Treat each bad sugar level not as a painful event but as an opportunity to improve. Even a few small changes can start adding up to bigger and better things. Carbohydrate counting courses are designed to help you better calculate the amount of carbohydrate in meals and adjust your insulin accordingly. Some carbohydrate counting courses, such as the DAFNE course, go even further and tackle a much wider range of strategies to improve your control including setting carbohydrate to insulin ratios, setting basal insulin doses and dealing with a variety of events in day to day life such as dealing with exercise and illness. If you’ve not been on a carbohydrate counting course in recent years ask your diabetes team if you can be referred onto one. To really get a clear idea of how your sugar levels vary from hour to hour and even minute to minute, ask to have a trial on a continuous glucose monitor (CGM). A CGM will give you a chance to view detailed graphs of how your sugar levels are varying through the day and after the trial, your diabetes health team will talk you through the results including work out what you can do to improve your control. Availability to CGM trials can vary from one part of the country to another but it’s well worth asking about.